The U.S.A is the richest, most powerful and the second largest country in the world. 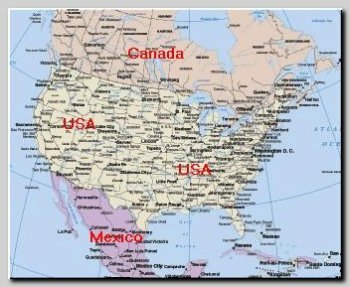 Including Alaska and Hawaii the territory of U.S.A is about 9,630,000 km and the population reached on 03/2007 more than 300 millions. About 2.6% from the general population, about 8 millions are Muslims. Unlike Europe, where in each country there is a dominant group of Muslims: Pakistanis in Great Britain, Turks in Germany, Algerians in France or Moroccans in Spain, there is not a prominent Muslim group in U.S.A. In general there are four main groups of Muslims in U.S.A.
A. The local black American – Muslims who more an integral part of the Western and mainly the American multicultural Democracy. B. The Shiites Muslims, most of them fled Iran in 1978 after the Islamic revolution, were supporters of the Shah and many of them are supporters of the U.S.A today. In the last years the Shiite Muslims are declining to a bitter conflict with the Sunni Muslims. C. Sunni Muslims from Pacific Asia from countries like Indonesia, Malaysia and other places, most of them practicing moderate and tolerant Islam. D. Arab and Pakistani Sunni Muslims, most of them immigrants that chose to live in U.S.A but at the same time preserve their cultural bonds, ties to their families and personal feelings are still with their old homeland in Pakistan or the Arab World. After the Second World War in 1945 U.S.A emerged as the new foreign super power in the Middle East replacing France and Great Britain. Since then U.S.A conducted a very aggressive and continuous policy of constant interference in the Middle East, its regimes and its economy. This involvement is in context of the world wide interests of U.S.A in oil, the cold war against the Soviet Union and, lately, the War on Terror, as U.S.A refers to the Global Jihad.